Many of Iran’s once flourishing wetlands have dried up recently. Lake Urmia, the sixth largest salt lake in the world and a UNESCO Biosphere Reserve, now threatens to vanish, too. Spanning an area larger than the Dead Sea and the Great Salt Lake combined, the dwindling lake lies tucked in the Zagros Mountain range in northwest Iran near the Turkish border. Hossein Akhani, a biologist at the University of Tehran, argues that Iran’s high water consumption and demands from energy and agriculture have put too much pressure on the lake. Disturbing photographs of the lake today compared with those from two decades ago show that the southern half now completely evaporates in the summer. Plants, migrating birds like flamingos and pelicans, a unique species of brine shrimp, and other wildlife have begun to disappear. Akhani traveled to Washington D.C. in February for his first meeting of the American Association for the Advancement of Science. In a symposium titled “Iran: Science Cooperation in a Post-Sanctions Era,” he spoke in fluent English—his second language—about Lake Urmia’s plight. Afterward, he met with SciCom’s Ramin Skibba, often pausing to translate a word properly or to convert from the Iranian calendar. How did you become involved in environmental and ecological research? In 1987 I was employed as a part-time researcher in Iran’s Darabad Museum of Natural History. I performed studies of national parks and protected areas. 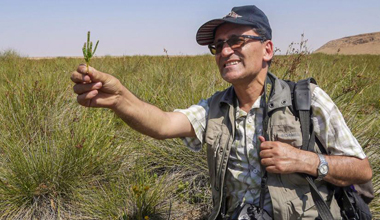 Then I continued my research in saline habitats like Urmia Lake, and [I studied] biodiversity in protected areas including Gulestan National Park in eastern Iran, one of the richest natural parks in the Middle East. I did my Ph.D. thesis there. What was Lake Urmia like in the 1990s? It was a large lake and people often swam there. Many people believed that swimming in the salty lake was healthy for their skin. There were a lot of hotels and tourist centers, but now unfortunately most of them are out of business. Based on your research, what are the main reasons why the lake is receding? The main reason is the extensive water use in the basin, which happened after 54 dams were constructed in the area. There are only eight permanent rivers, so there is no chance for running water to flow into the lake. There are also a lot of wells, which pump water from underground aquifers. These two pressures prevent water from accumulating in the basin. When did you realize that the lake was shrinking and that this was a serious problem? In 2001, when I visited the northeastern part of the lake to collect plants, I saw that the lake was receding and there were many areas where the salt was exposed. It was completely different from what I saw in 1987. Were plants and wildlife struggling to adapt? Over thousands of years, salts accumulated in the lake’s basin. When the lake shrinks, the area exposed to air is extremely salty. There is no chance for plants to grow there. After the lake became desiccated, we lost many vegetation types. Plants just dried up or were in bad condition. The salinity tolerance of brine shrimp is 160 grams of salt per liter, but now the salinity of the lake is almost 450 grams per liter, so they cannot survive in these conditions. [For comparison, Utah’s Great Salt Lake ranges between 142 to 317 grams/liter.] In the surrounding wetlands and estuaries, the salinity is lower, so we can still find them there. When the shrimp are gone and flamingoes come and find the remaining water extremely salty, then it’s dangerous for them. We’ve lost many migratory birds coming to the area. "Instead of criticizing Iran, the world should do something! It’s the duty of developed countries that have more scientific facilities and funding to help." And how will climate change affect the region’s ecosystems? The temperature has increased in the Middle East at almost twice the rate of more temperate regions: 1.4°C rather than 0.8°C. Climate change, combined with land use and water mismanagement, accelerates the problem. After the lake becomes desiccated, the microclimate changes, which further increases the local temperature. If nothing were done, what would happen to the lake? If land use and water consumption remain as they are now, then the lake will disappear pretty soon. There’s no doubt about that—unless there is an unexpected rainfall, but we cannot rely on that. We believe the only way to help the lake survive is to take emergency action to stop further reductions, and then try to restore it in a reasonable time and reduce water consumption in a well-managed plan. What do you think are the main courses of action Iran should try to take in the next few years? Agriculture in the area is currently unsustainable. You could provide technologies and improved irrigation systems that require less water. Agricultural products that use lots of water, such as sugar beets and apples, should be reduced. Previously, the area was famous for its wine production, which needs one-fifth the water of apple production. We need to support the farmers to change the crops they are cultivating, and the government needs to compensate them during this transition. Many dams transfer water to urban areas where the population has grown tremendously in recent decades. With the restoration projects running now, the construction of new dams is prohibited, fortunately. I think we need to take the same approach people did here. The U.S. made thousands of dams. [When scientists] realized that many of them destroyed habitats, they started removing them. It should be our goal to remove many dams. It sounds similar to Mono Lake in California. Los Angeles was taking a lot of water from the lake, and it was shrinking and its habitat was suffering. They’re still trying to save the lake today, but it’s recovering. Mono Lake is a good example of a correct decision to restore a lake. Thanks to the activities of Friends of Mono Lake Reserve—about 16,000 people who were involved took judicial actions and got water rights back to the lake— it was a great success. We should learn from Mono Lake’s history. Owens Lake [in eastern California] is completely dry, and they are spending $1.2 billion to prevent dust emission in the area. This lake is only 5% the size of Lake Urmia. If we were to use the same measures, it would take hundreds of billions of dollars. It is less costly and more practical to save the habitat. In your presentation, you mentioned the government’s current restoration plan. Are people working on it now? Yeah! The Urmia Lake Restoration Committee set up expert committees that made an action plan in 2014, which was approved. In the Iranian calendar for 2015 until 21 March 2016, $660 million was invested in 88 projects in the area. For example, they gave 200 million cubic meters of dam water to the lake and connected two rivers so the water flows more easily. They are constructing a canal to bring water from a river near the Turkish border to the lake. They also started subsidizing agricultural sectors to reduce their water use. How will the lifting of the sanctions aid these efforts to restore the lake? When the sanctions are lifted, there will be more opportunities for cooperation between Iranian and international scientists. Then we can learn more from [similar water problems] in the United States. The new era will also help restoration programs. Environmental conditions in Iran became worse after the revolution, because of sanctions and the eight-year war in Iran and Iraq. I’m sure that if relations between Iran and the world improve, then there will be chances for foreign investment in the country, implementing new jobs for people, and supporting industries that reduce pressure on the environment. Environmental problems are world problems, and the world should work together to solve them. But sanctions make them worse, since you can’t import necessary technologies, talent or manpower. Are people in other countries trying to help? 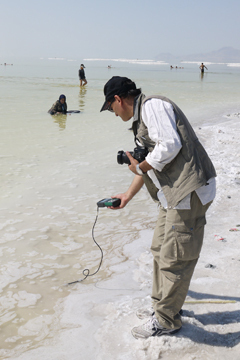 In recent years, the case of Lake Urmia became more publicized in international media and generated interest among scientists and international organizations. For example, Japan invested $1 million in the area to improve agricultural management. Several international meetings took place in Iran, and even scientists from the United States came. The Iranian government is very open and welcomes any kind of contribution. Iran’s education and universities expanded in the last 20 years. There are more than four million students in Iranian universities, and the number of scientific publications in Iran has increased. But during the sanctions, we couldn’t get equipment and didn’t have opportunities to participate in international conferences, and exchanging students became difficult. Lifting sanctions will be beneficial for Iranian universities and universities in developed countries. We have seen thousands of Iranian scholars [working] in the United States and Europe. Several of my own students, after they finished their degrees, have gone to developed countries. Iran is a huge country and provides a unique platform for top researchers, especially in the fields of photosynthesis, plants, adaptation to harsh environments, and other environmental and biodiversity issues. When the economic situation and the stability in the area improves, our educated students should have opportunities to stay, too. Are there other things you’ve been thinking about lately regarding the sanctions? Our big concern now is that [U.S.] Republican presidential candidates say if they are elected, they will cancel these agreements. This would disturb an achievement that cost decades of negotiations. We should not destroy what has been planted—such a very expensive cultivation. I hope we’ll always think that relations and cooperation are the best solution for solving problems. How long do we have to have conflicts? We are big nations! Not all Iranians love America, but they have a lot of enthusiasm for development, a better life, and to be in contact with the world. We have to try to respect each other in spite of our differences. © 2016 Ramin Skibba. Ramin cultivates his writing at raminskibba.net.